Mix up rounds of frozen watermelon daiquiris, lemonades, and martinis quickly and easily with this Finest Call watermelon puree drink mixer! It delivers a "true to fruit" taste that packs powerful flavor and enhances the vivid pink color of any cocktail or mixed drink. Thanks to its rich, smooth texture, it's also a great accent to your favorite desserts! Pour Finest Call watermelon puree drink mixer into smoothies and other blended drinks for signature, sweet watermelon flavor. This Finest Call premium watermelon puree drink mixer has a smooth texture that dissolves easily in your most popular drinks. Since watermelon is such a refreshingly sweet flavor for drinks and desserts, you'll be sure to find an endless number of ways to use this versatile drink mixer. 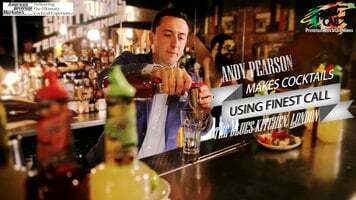 Combine that with its user-friendly packaging, sleek design, and patented pourer top, and it's sure to be a smart addition to any bar service! For a frozen watermelon daiquiri, blend 4 oz. of Finest Call Watermelon Puree Mix, 1.25 oz. of rum, and 1.5 cups of crushed ice. Refrigerate after opening. I ordered this syrup to use as additional flavor for my fresh lemonade this summer. My customers absolutely love the fresh watermelon flavor! The nifty pour spout makes it quick and easy to use! Very sugary with a thick syrupy consistency. Mixes well but a little goes a long way. We've watered it down to get it to flow a little better. our whole family likes this watermelon flavored puree drink mix with tonic water.its very reasonable price the adults like it with some vodka or tequila! A great tasting watermelon puree that is a great sweetness and awesome for flavoring any beverage style. Also a great puree or shaved ice or snow cones. The mix is definitely sweet, and a little goes a long way! 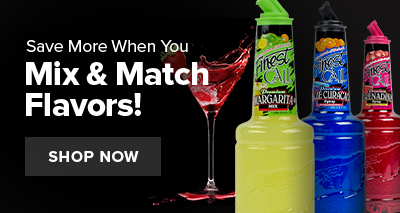 It's great for any type of drinks you have in mind alcoholic or non alcoholic drinks. Great flavor. We decided to do a limited-time summer flavor for our margaritas and thought watermelon would be the perfect choice. Most of the customers seem to really like it. I used this puree mix with fresh lime juice, greek yogurt for the base to create a creamy smoothie, two servings of fresh watermelon, approximately I cup and it is beyond delicious. There entire line of purees are absolutely delicious. Finest Call has done it again! Great taste, excellent price, with a easy to hold bottle and a convenient flip top pour. 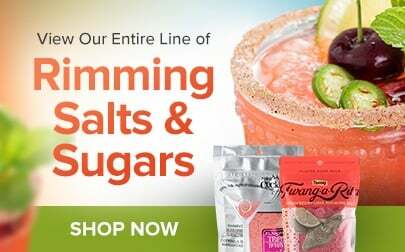 Finest Call Watermelon Puree Mix can be used to make mixed drinks, smoothies, flavored tea and so much more. Watermelon icees are my kids favorite summer beverage. The mix from finest call is great. I just mix the puree with water and freeze. I then blend it up with a touch of sparkling grape juice and the result is fabulous. Fines call delivers again with their fresh tasting watermelon puree. The Finest Call Watermelon Puree Mix can be served in various recipes. This product is excellent for making fruit smoothies, daiquiris, and frozen icy pops. I've been loving watermelon margaritas lately so I thought I'd give this a try and make my own at home. I love it and just like the other flavors of finest call I've tried, its delicious! Wow! This watermelon Flavor is excellent for smoothies and milkshakes. The taste is perfect for summer and our customers love the variety. Great for Italian sodas as well. We went on vacation to Mexico and the hotel had a margarita bar. They would use watermelon and fresh juices to make there margarita. I feel that this Puree make mine taste just as good. 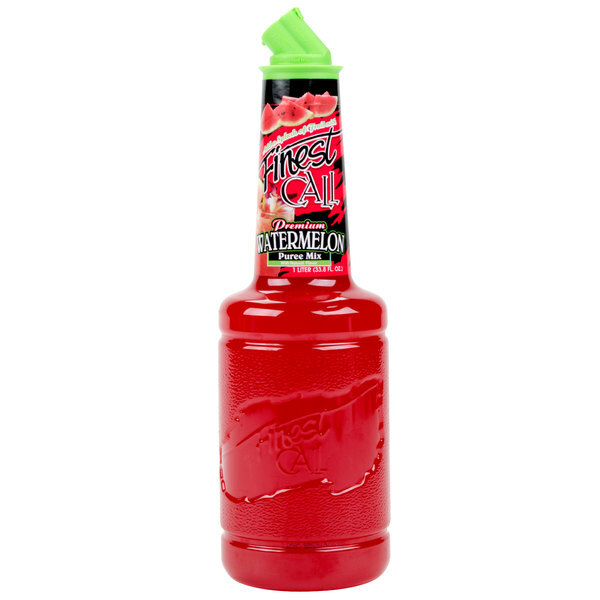 Finest Call's watermelon puree mix is the best watermelon flavoring mix I have ever tasted. It manages to give the slight undertone of watermelon without being overpowered by sweetness. I would highly recommend this product. Really good. I bought it to use in a cocktail recipe...it worked (and tasted ) perfectly. Easy to store and has a nice pour top. I used to purchase this in the big brand stores and am SO SO glad I found them on here for way cheaper! I use this for both alcoholic and non alcoholic beverages. The watermelon flavor is a bit strong, so don't use too much. Mix flavors together for an even better drink! Finest Call Watermelon Puree is a fresh welcome to our drink line up. Finest Call has done it again. An instant hit with our customers. Tastes like a fresh slice of watermelon. Great addition to both frozen and liquid beverages. Many raves over the lemonade mixed with this. Also great as a margarita or with gin. Great price too! This is the best watermelon puree ever!! Used it for watermelon lemonade at a concession stand. We sold completely out and received so many compliments. People kept asking for the recipe. Finest Cal Watermelon mix makes the most AMAZING margaritas! Definitely a crowd pleaser be sure to stock up!! The consistency and color is vibrant and delicious. WOW!! This watermelon puree is addicting . Perfect for the Summer so refreshing and a must have for any daquiri fan . I'm not the biggest fan of sweet drinks but this sure hits the spot . Its a good product. We have a watermelon beer and wanted to pair it with a watermelon liquor drink. This product did what we needed it to do have we have had success. At 32% juice, this is certainly one of our favorites in the Finest Call Premium line of purées! So,glad that we're able to purchase this at such a great price point from the Webstauarnt store and have it delivered. Great product! Finding a good watermelon puree is not easy. I normally can't find most of these at my local retail stores, but this puree tastes great, and is delicious! This was a little more sour than I was anticipating. I used it to flavor iced tea and lemondade but it took more than the other flavorings I use. It makes a great seasonal item, and my customers loved it! Get a refreshing watermelon drink with this mix. Tastes so great with just crushed ice. You can also enhance the flavor by adding crushed mint. A good drink for the summer.